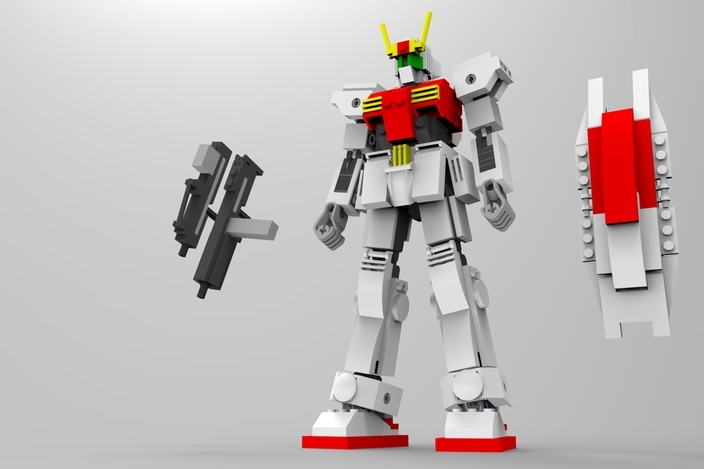 PhillipeV8 has chosen this Lego Gundam for this week's Speed Render Contest. Do your best rendering in 2 hours or less. Hah, funny. I like. Unfortunately, I've been too busy to do a rendering... Where's Esben when you need him to drum up some participation and excitement? EDIT: Seems like this thread has been dead for a while. Didn't notice that yesterday. Oh well. 10min on positioning geometry in NX. 25min on preparing the scene in KeyShot. Started with a black environment and added two spots in it. Used the edge blend/fillet function in KS with 0.01 radius. Used a lot of translucent material for the white pieces. regular plastic for the red pieces. Also added two spheres inside the eyes with area light (1W green light). 45min on rendering using samples render(256). Stopped after a while. 30min on photoshop editing. Attaching before and after photoshop edit. Strange that they allow some LEGO figures on GrabCAD. Mine was removed due to a complaint, stating it was an irrelevant non-engineering object. Might have been too simple perhaps. Now that I'm working with 64 bit and a smashing 78 fps, I'm able to open this model. While Magnus Skogsfjord beat me on the "arm pointing at viewer" picture (thanks for the "fillet function" hint), I present a movie cliche gangsta version.